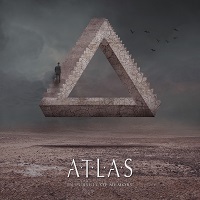 ATLAS is a Melodic Rock band from the North of England, comprised of five musicians with the intention to create a sound with roots in the AOR genre, but also with elements of Metal, Progressive music, and even Jazz. On their debut EP, “World of Motion,” they drew from classic bands like TOTO and JOURNEY, to modern acts as ART and W.E.T., with a little DREAM THEATER thrown in as well. They are back now with their debut full-length, titled “In Pursuit of Memory,” which contains twelve tracks. “Samsara” is the opening track. One thing that strikes me right away is that singer Wells is perhaps just bit out of his range here, as the upper notes are pitchy. The music is really strong however…a collection of edgy guitars and keys, with a big chorus. Fortunately, it gets better from here. “Bad Habit” is a heavy and aggressive song with a lot of energy, and Wells seems more comfortable in the upper ranges here…perhaps it was just an anomaly with the first song. I can’t quite however put my finger on who he reminds me of as a front man…part early Bon Jovi with a bit of Ted Poley perhaps? In “Breath Me In,” the Bon Jovi comparisons are more pronounced, in a great AOR song with a lot of harmonies and a tender touch. “Flesh and Blood” is an undeniable winner. Wells seems much more in his element here, and the charming song is full of hooks, along with memories of days gone by when things were simpler. This song could have been on high rotation on MTV back in the day, but retains a modern touch as well. “As Time Goes By” is a high energy rocker with wispy passages, like your head is caught in that perfect summer breeze. They key change leading into the chorus is an odd thing for me, for a song that is otherwise near perfect in its effectiveness. “In the Frame” uses a nice bass line combined with clear guitars, and a big chorus with plenty of harmonies, and I can feel the album catching up to where it should be. “Lock and Key” has a tougher sound, still with plenty of melody. The extended guitar solos here are very well done, and follow the melody line very well. “Seasons Change” is another more tender mid-tempo song, with a message of “seasons change, and I get over you.” It has a simple but catchy melody, and it’s easy to like. “Signal of Hope” is the piano based song we were waiting for on any good AOR album. Wells really puts a lot of emotion into this song, and no one could accuse him of just going through the motions as a singer. “Letting Go” is another winner. It has a crisp and upbeat sound…almost playful at times. It’s the kind of song you might play with the top down in your car, without a care in the world. “Supernova” is a faster moving song with hasty guitars and strong vocal harmonies. The chorus is big and full and catchy, melding all of the element together. “Live and Forget” closes the album, featuring keys more prominently, and a message of “no regrets.” The pause at the five minute mark is great—but doesn’t make a lot of sense within the structure of the song. Overall, this is a good album. Sometime however I feel the connections are just a bit off from verse to chorus, and some of the verses meander just a bit much. When they find their touch, it is truly magical. But there just weren’t enough of these moments for me. Being that they are a young band, I would fully expect them to find this touch for their next release.